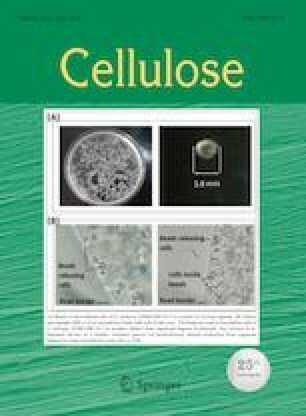 To graft epoxy and ester functional groups onto cellulose nanofibrils (CNFs) and to overcome their poor hydrophobicity, we studied the modification of CNFs using graft copolymerization with glycidyl methacrylate (GMA) by a Fe2+–thiourea dioxide–H2O2 initiator system (Fe2+–TD–H2O2) in aqueous solution. The synthesized poly (GMA)-grafted CNF (CNF-g-PGMA) was characterized by FTIR, AFM, XRD, water contact angle, and TGA. GMA was successfully grafted onto the CNFs by Fe2+–TD–H2O2, the epoxy groups and ester groups of GMA were clearly present and intact in the CNF-g-PGMA, and TD is an important component of the initiator system under relatively mild graft conditions. CNF-g-PGMA may be an important intermediate because of its epoxy and ester functional groups. The main nanostructure of the CNFs was retained after graft copolymerization, and there were no obvious effects of graft copolymerization on the crystalline structure of the CNF backbone, although the crystalline index slightly decreased with the increased percentage of grafting. Graft copolymerization significantly modifies the CNF hydrophobicity. This strategy could extend the applications of CNFs into many areas. The authors are grateful for the support of the National Natural Science Foundation of China (Grant No. 31070524), and the Major State Basic Research Development Program of China (Grant No. 2010CB732205).